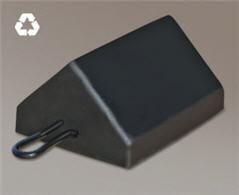 Rubber Wheel Chock 8" x 10" x 5.5" The 450 Series Rubber Wheel Chocks feature the chock design used by most utility and telephone fleets. They are strong, safe and resistant to damage from UV, moisture, salt and oils. Their traction design grips tire and road and will not cause tire or pavement damage. The chock design also allows either side to be positioned against tire. They are made from recycled materials and have an integrated steel loop carrying handle. This model has a steel cleat bottom that provides extra stability in ice.